Wine Tasting Topic: Wine Glass Type - Does it Affect the “Taste” of Wine? Does the Type of Wine Glass Effect the "Taste" of Wine? Many wine tasters are adamant that an optimum glass in terms of size and dimensions exists for a particular wine type or even style. that it is absolutely imperative that the correct glass be used if maximum enjoyment is to be had. But how much of this idea has truth in fact, and how much is the result of concerted marketing efforts on the part of some glass manufacturers to effect a marketing point of difference. other things, body, and (in red wines), astringency. The separation of these is not just an academic exercise as for a variety of logical reasons it is likely that the size and shape of the glass should affect these to largely varying degrees. Despite these strong beliefs about the importance of glass shape, little scientific research has been conducted in this area, but two recent reports have thrown some light on the effect of glass type on the aroma of wines. Tastings were conducted blindfolded so that the tasters could obtain no visual cues. Regardless of the wine type (red or white, clean or volatile), the total aroma intensity of the wine was highest in the Riedel Burgundy®, followed by the ISO, followed by the Riedel Chardonnay® glass. The differences in aroma intensity were relatively small, being 1 point or less on a ten-point intensity scale. Total intensity of aroma was highly correlated with the ratio of the glasses cup diameter to the diameter of its opening. "Impact of wine glasses for sensory evaluation"
by Ulrich Fischer ( ufischer.slfa-nw@agrarinfo.rpl.de ) and Britta Loewe-Stanienda. This extensive article consisted of two parts, the first reporting the effect of nine different glasses on the aroma of two white and two red wines, whereby the subjects were able to see the glasses from which they smelled. The second part consisted of a comparison of four different glasses but without the tasters being able to see the glasses. This paper will report the latter study as visual cues and biases on the part of the tasters were not a factor. 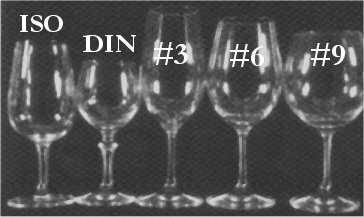 Compared five glasses of varying cup diameter, cup height and cup opening (two of these being the standard international ISO, and German DIN tasting glasses). Figure 1 below, gives the shapes of the glasses being compared. Assessed the fruit aroma profile (citrus, spicy, smoky) and the sulfur dioxide, sulfide and untypical ageing faults, found in fifty one clean and faulty red and white wines. Two of the glasses (#9 and #6 below) produced a greater overall aroma on most of the characters under study (up to 64% stronger than the ISO). Interestingly, despite their differing dimensions, the aroma profiles produced by the two glasses was almost identical. Glass 3 produced a similar aroma profile to the ISO glass despite it being very different in shape. The DIN glass with its small cup and relatively wide opening resulted in aromas of less than 50% the strength of that produced by the ISO glass for most of the aromas assessed. As per Cliff (2001), the intensity of aroma was highly correlated with the ratio of the glasses cup diameter to the diameter of its opening. Despite the claims of some manufacturers, it would appear that a number of glasses of different shapes are equally effective in "optimising" the aroma of wines. These studies suggest that a major factor in "enhancing" aroma is the ratio of the glasses cup diameter to the diameter of its opening. The results of these studies cannot be extrapolated to taste, flavour or mouthfeel in wines.